Ruby steps into a tavern, The Tickley Tentacle,” and discovers her old friend, the Tookah, behind the bar polishing glasses. 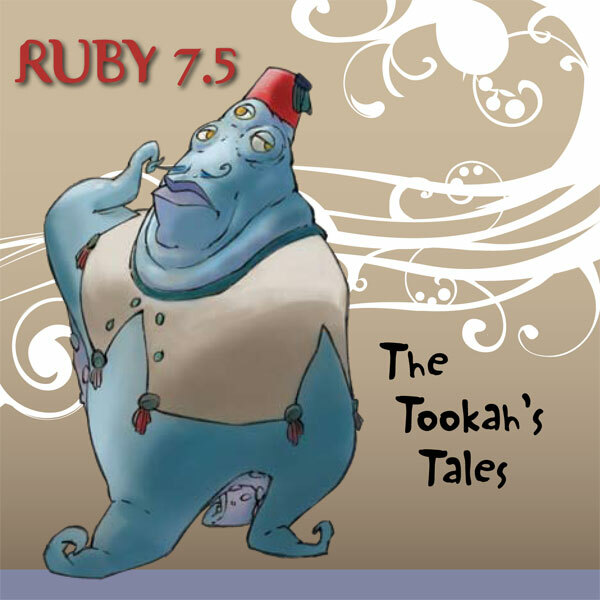 Ruby entices the Tookah to tell his strange tales of what it’s like to live on other planets, especially if you have four tentacles, three eyes, a thin blue mustache, and wear a red fez. A few of the Tooka’s tales are: The Ups and Downs of the Down and Out; Bug-A-Boo 13; Don’t Loose Any Sleep Over Me; Juzili 3; The Platinum Blonde in the Pink Pillbox hat; Night-time is the Right Time; and, It Was a Sad Day in Noodle Town. “Noodle Town” is a city built of hollow tubes, everything and everyone is shipped, or sucked, through pneumatic noodles. From a distance, Noodle Town looks like a gigantic plate of rigatoni. It was here that the Tookah fell in love with the beautiful Zita, a temple priestess of the Pasta Pagoda.